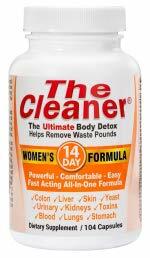 The Cleaner is a powerful total internal cleansing support system with over 25 natural herbs plus minerals in each serving. It includes organ and parasite cleansing in easy to swallow capsules. After use of The Cleaner, clothes may fit loosely in the stomach area due to the elimination of waste. The Cleaner is fast and powerful yet gentle enough to allow you to travel, work and continue your normal routine. The Cleaner uses vegetable capsules instead of gelatin for those who desire an animal free detox. The ultimate body detox helps remove toxins and waste pounds by thoroughly cleansing colon, liver, kidneys, lungs, stomach, and other organs. Take 4 capsules on the evening of day 1, then take 4 capsules in the morning and 4 in the evening on days 2 through 7. Do not use for more than 7 consecutive days. This product works great with me.